The Los Angeles Times is reporting the future. 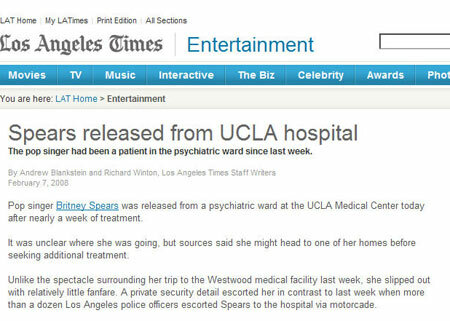 They reported that Britney Spears was already released from the loony bin at UCLA Med Center -tomorrow, February 7th. The LA Times will comment on this typo yesterday, February 5th. I digress. Sources say that Britney will be heading home. Hopefully she’ll get the gift we left on her driveway!!! More to come on this developing story…. Teaser: The Derobers go to Britney Spears’ house. Derober Exclusive: Britney still has deep pockets. Where is she going? What happened last night at Britney’s house??? Every day we face with countertop,you can have a high quality of life with granite countertop of yalitongstone,but we will also very pleased if you can see Huaxingstone’s granite countertop.when you come to bathroom,you need aspecial product like Ceramic Sink.